Sometimes I browse Facebook with peter's account. I only do it to see what my family members are up to. I also enjoy reading my brother's informative page, One Body for Christ. They post great information on healthy lifestyles. Check it out at Facebook.com/onebodyforchrist. Today I saw that they posted this chart for people who think eating healthy has to be difficult. 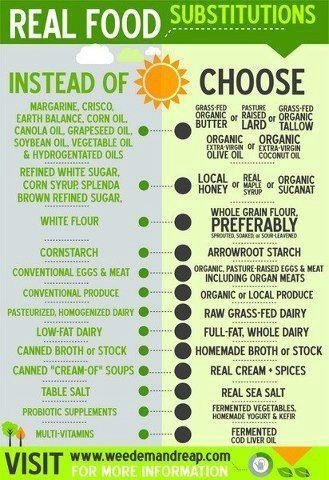 It's as easy as substituting healthy items for non healthy items. Check it out! Good list! Thanks for sharing! !